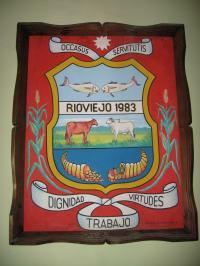 Rio Viejo (a.k.a Rioviejo) is a municipality located in the Bolívar Department. It was founded on 26 August 1785 and became a municipality by ordinance no. 10 of 26 November 1982. The flag of Rio Viejo is horizontally divided blue-white-red. "White represents peace that has always been ruling the municipality, blue represents the wide sky and red represents the blood shed by the celebrities of the municipality."